Steven (Chicagoland, United States) on 26 October 2017 in Landscape & Rural and Portfolio. A view of the gorge that the Hornblower is navigating with the three falls that make up Niagara Falls. The view of the Falls is always better from the Canadian side. Yet the skyline of the Canadian side is always better than the American side. Nothing really dots the skyline on the American side, as can be seen here. To the far left is Rainbow Bridge which connects Canada and the United States. And from left to right are the American Falls, Bridal Veil Falls, and a portion of the Horseshoe Falls, all which make up the Niagara Falls. The frequent mist generated from the crashing Falls will bring many rainbows to fruition. Photo captured on September 25, 2017. It is fantastic to see this view. You really are capturing the magic in this series - well done ! Superb compositional skills with this rainbow arc in a nice tandem along with the arc of the distant bridge structure, not to mention the beautiful colours of all of this. WOW! Each of these views is more magnificent than the last! 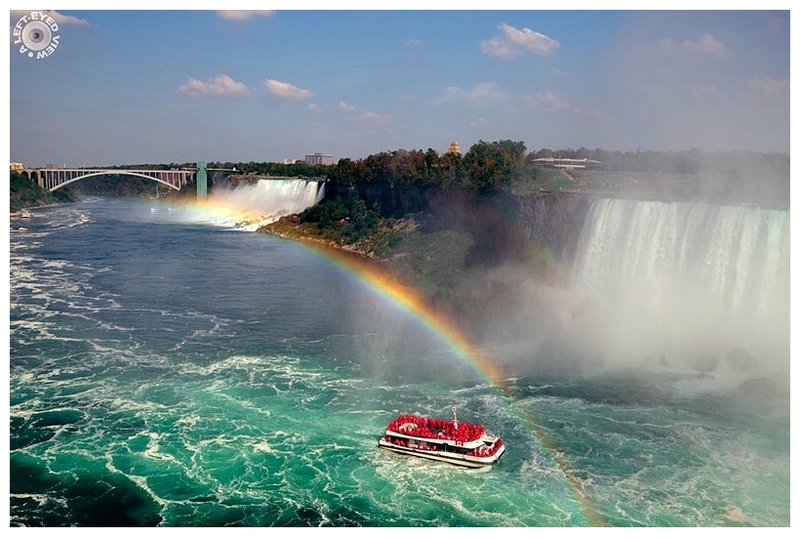 The size of the falls dwarfs the boat, making it look like a toy. Oh wow you found it!!! The rainbow is a bonus. And if legend of gold and rainbows were true, then there would be a lot of gold in that place. A very dramatic image of this boat and the beautirul rainbow. Amazing scene to enjoy! Absolutely gorgeous. Such a beautiful view. I love the rainbow! I would love to go there again! Quel arc en ciel et vue quelle chute ce bateau ce pont grandisoe vue. Wouah , magnifique ..etre là au bon moment c'est formidable ! Sublime composition: deux arcs pour un bateau! Sublime composition: two arches for a boat! Wow, wonderful view ! I love it ! Fabulous colors and swirling mists and waters. Fabuleuse photo !!! Un instant T à ne pas manquer ! Fantastic image, with a wonderful rainbow. This is a remarkable image of a so much photographed place. You got everything in there in the right moment. Wonderful greens as in all the series. This is definitely worth the wait!